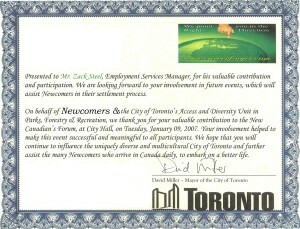 Letter of commendation for creating the first ever Newcomers Forum in Toronto, which helped in the promotion and passage of Bill-124 – The Fair Access to Regulated Professions Act, 2006. The event was held in the Rotunda, at City Hall, in Toronto, Ontario, Canada, on January 9, 2007. Presenters included, Keith Pelley, former President of the Toronto Argonauts Football Club, former Mayor of Toronto – David Miller, City Councillor – Shelley Carroll, former Minister of Citizenship & Immigration and MPP – Mike Colle, former Official Opposition Labour Critic Gerry Martiniuk, Padre Hernan Astudillo, Ken Jeffers – Manager of the Access and Diversity Unit for the City of Toronto, former Manager of Parks, Forestry and Recreation – Brenda Librecz, Zack Steel former Employment Services Manager. Newcomers Forum Canada.